Published on October 4, 2018 at 12:00 am . Vancouver, BC, October 4, 2018 — Hurry! 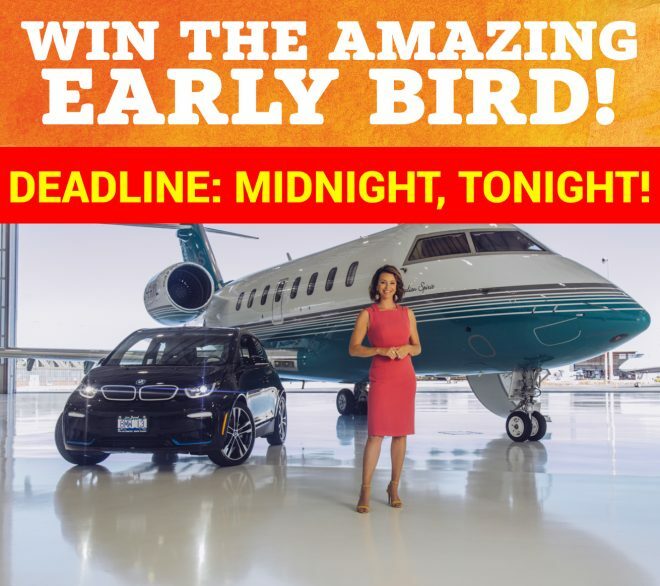 The BC Children’s Hospital Dream Lottery’s Early Bird Deadline is Midnight, Tonight! This is your last day to play for bonus draws worth over $325,000 in prizes. Plus, you’re in to win a 1 of 7 Grand Prizes – including a $2.7 million Dream Home package, or $2.2 million tax-free Cash! Early Bird Deadline: Midnight Tonight! Buy Now, Win the Dream. 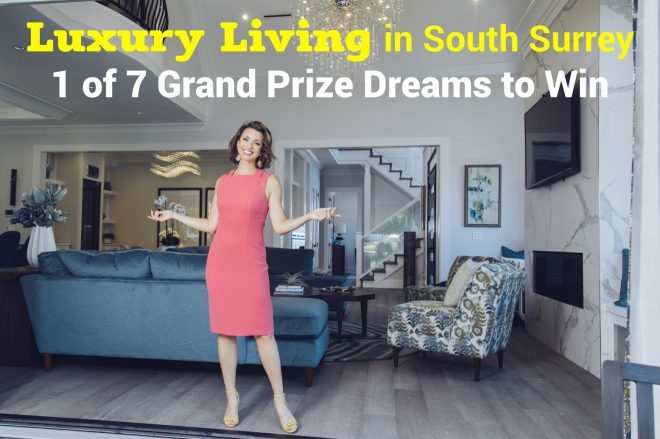 Win the Grand Prize Draw and choose a $2.7 million ‘Luxury Living’ Home package – one of our most incredible dream homes ever! It’s a 5-bedroom home in South Surrey (over 5,000 square feet), and it comes with furnishings and cash. Or choose 1 of 2 home packages in South Surrey, an ‘Income for Life’ package with condos in Vancouver and Richmond, an Ocean Cottage at SookePoint on Vancouver Island, or an incredible Okanagan Home at Vernon’s Predator Ridge resort community. Homes all across the most beautiful parts of Beautiful B.C. Or $2.2 million Cash! Don’t forget to get your tickets for the 50/50 PLUS jackpot – jackpot now over $1,567,800 – and the Big Passport PLUS game – with 101 extra winners, and an extra $335,000 to be won. As the only hospital in the province devoted exclusively to kids, over a million count on BC Children’s for care they often can’t get anywhere else. 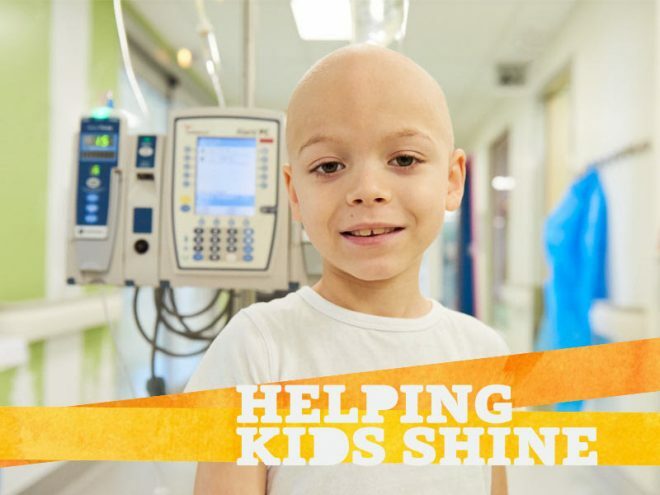 By purchasing a lottery ticket, you’re helping shape the future of child health. Proceeds go toward research initiatives at BC Children’s Hospital—supporting over 1,000 of the most daring thinkers in science as they work to pursue new knowledge. Their discoveries are then translated directly into improved care to benefit kids within the hospital, across the province, and around the world. Each year, the Dream and Choices Lotteries raise approximately $8 million for BC Children’s Hospital Foundation. Published on October 2, 2018 at 6:32 am . Win the Dream, Live the Dream! There are only 2 days left for this year’s amazing Early Bird! Order today and you’re automatically entered to win over $325,000 in prizes. Plus you’ll be in to win 1 of 7 Grand Prizes – including a Dream Home package worth over $2.7 million, or $2.2 million tax-free Cash. Early Bird Deadline in 2 Days! This year’s Grand Prize Draw has something for everyone! Choose a $2.7 million ‘Luxury Living’ Home package based in South Surrey’s idyllic family-friendly neighbourhood of Grandview Heights – a 5-bedroom, 5,000-plus square-foot home with $120,000 in furnishings and $25,000 cash. Or choose 1 of 2 home packages in South Surrey, an ‘Income for Life’ package with condos in Vancouver and Richmond, an Ocean Cottage at SookePoint on Vancouver Island, or an incredible Okanagan Home at Vernon’s Predator Ridge golf resort community. Homes all across the most beautiful parts of Beautiful B.C. Or $2.2 million Cash! Don’t forget to get your tickets for the 50/50 PLUS jackpot – jackpot now over $1,475,000 – and the Big Passport PLUS game – with 101 extra winners, and an extra $335,000 to be won. Say YES to BC Children's Hospital. Fall Reward Deadline: Midnight, Tonight! Published on September 14, 2018 at 12:00 am . Win the Dream… Live the Dream! Win Homes, Cars, Travel, Cash, and plenty more. This year’s BC Children’s Hospital Dream Lottery is offering over $3.9 million in prizes! Over 3,100 prizes to win – plus the extra 50/50 and Big Passport games, starting at only $15 and $20 per ticket. Looking for your Dream Home? This year’s biggest winner will 1 of 6 amazing home packages, all located in the most beautiful parts of Beautiful B.C. There are three homes in South Surrey – including the 5,500 square-foot ‘Luxury Living’ mansion. Or take the ‘Income for Life’ Grand Prize and you’ll be the owner of condos in Vancouver and Richmond – and it comes with $300,000 cash as well. Or live the good life in the Okanagan, in Vernon’s Predator Ridge golf and resort community… or feel the surf and wake up to ocean views every day at SookePoint on Vancouver Island. OR choose $32,000 tax-free Cash – and become instantly richer! Did you know? 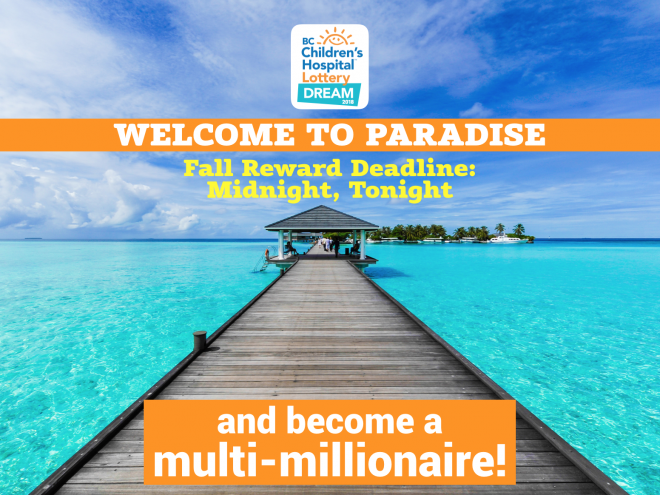 If you order your tickets before tonight’s Fall Reward deadline, your tickets automatically get you into the $325,000 Early Bird draws, too! Win a trip you’ll never forget – a private jet for 6 people to Maui, plus 5 nights of 5-Star accommodation. Say Aloha with your best friends or your family, and kick back on the beach in style! Plus this comes with a 2018 BMW i3 and $100,000 cash. OR choose Vacations for Life – a $200,000 travel gift card from Carlson Wagonlit, and $60,000 cash. Or choose $250,000 cash! The smaller the patient, the greater the need. By purchasing a Dream Lottery ticket, you’re helping shape the future of child health. That’s because proceeds go toward research initiatives at BC Children’s Hospital—supporting over 1,000 of the most daring thinkers in science as they work to pursue new knowledge. Their discoveries are then translated directly into improved care to benefit kids within the hospital. As the only hospital in the province devoted exclusively to kids, over a million count on BC Children’s for care they often can’t get anywhere else. 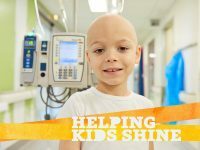 And thanks to your support, BC Children’s Hospital Foundation can help improve their lives today and define the future of children’s health care for generations to come. Say YES to BC Children's Hospital. Summer Bonus Deadline: Midnight, Tonight! Published on August 31, 2018 at 12:00 am . Vancouver, BC, August 31 — Don’t forget your Dream Lottery tickets… the Summer Bonus Deadline is Midnight, Tonight! It’s the last BC Children’s Hospital Bonus Deadline of the summer! 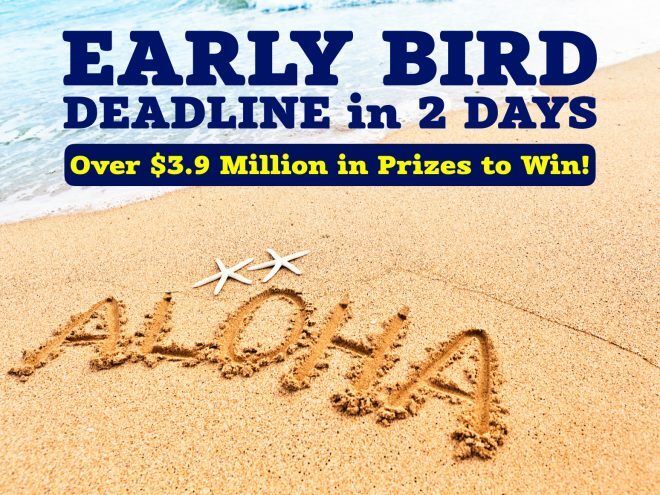 Order today and you’ll be automatically entered into the Summer Bonus and Fall Bonus draws, the $325,000 Early Bird draws, and a Grand Prize draw to win $2.2 million cash. Which will you choose? This year’s Dream Lottery brings you 7 Grand Prize Dreams… with homes all around Beautiful British Columbia! This year’s biggest home in South Surrey offers 5,500 square feet of luxury living in an idyllic family friendly neighbourhood – and comes in a Grand Prize worth over $2.7 million. And of course, there’s everyone’s favourite option – $2.2 million tax-free Cash. The smaller the patient, the greater the need. Together, we can transform lives. By purchasing a Dream Lottery ticket, you’re helping shape the future of child health.